With Election Day just six days away, it was one of the most explosive charges that could be made and it came from one of the most prominent political figures in San Francisco. Was District Attorney George Gascon failing to file charges in the case of a pedestrian killed by a bicyclist in July because Gascon was courting the powerful Bicycle Coalition for his election? “One wonders where justice is for this woman who visited San Francisco and ended up dead. I wonder why nobody seems to care. Is the district attorney waiting until after the election as to not offend bicyclists?” wrote former state senator John Burton in a letter to the Examiner on November 3. Then, the day before the election, the Chronicle’s Matier and Ross echo Burton’s question, pointing out that Gascon still has not filed charges. That afternoon, hours before the polls open, Gascon finally files misdemeanor charges. The District Attorney’s office explains the four-month delay as the result of waiting for the medical examiner’s report, but then can’t explain why the report was signed in August but not delivered until November. Gascon had come a long way from his first weeks in San Francisco, when he suggested that he would begin cracking down on the bicyclist signature event, Critical Mass, and suggesting that a ballot measure banning Critical Mass would easily pass. Gascon early on learned the first rule of City Hall: Dance with the one who brought you. And in Gascon’s case, that meant first making nice with the Police Officers Association, a bulwark of then-Mayor Newsom’s support but which strongly opposed naming an outsider as the city’s police chief. Gascon went straight for their sweet spot. He began shelving disciplinary cases against San Francisco police officers. Gascon called them “pragmatic” deals when he dropped charges against about 20 cops accused of first offenses. Among those who had charges dropped: an officer accused of domestic violence. With the victim unavailable to testify, Gascon gave a few days’ suspension and time in an anger management class, according to a Chronicle story at the time. As District Attorney seeking election to the job he won by appointment, Gascon knew one sure bet is that you don’t open prosecutions against powerful people who can affect your future. Consider the case of police officers identified in a video illegally entering the residents of the Henry Hotel without proper warrants last year. Gary Delagnes, Police Officers Association President, publicly denounced the release of the videos and called for the officers to be given “their day in court” in a March 2011 op-ed. Gascon had the video and the report, but he knew he didn’t want to start a war with the POA during his election. If those officers were going to get their day in court, George Gascon wasn’t going to be in that courtroom. He kicked the case to state authorities. This week Gascon’s press office confirmed that the case remains with federal officials. Consider the case of the Muni bus driver who struck and killed a pedestrian in a Castro crosswalk in August. The Transportation Workers Union is one of the powerhouses in San Francisco elections. From August until the Election, Gascon went silent. He finally filed misdemeanor charges – on January 13, 2012, months after the election and more than a week after he was sworn into office. 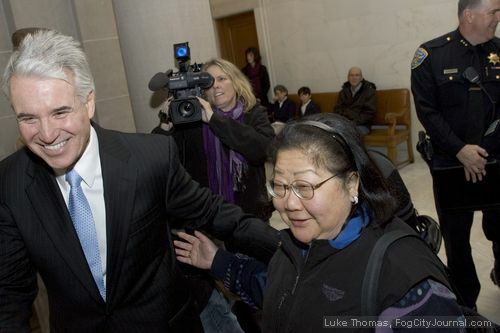 The POA, the Muni drivers union and the bicycle coalition are among the most politically influential, but they still have to take a back seat when the cases involve then-Interim Mayor Ed Lee, former mayor Willie Brown and Chinatown influence-peddler Rose Pak. It was a lethal combination for anyone who might place obstacles in their way, much less for anyone who might consider actually taking action in cases involving crimes. Before Gascon accepted the appointment as District Attorney, he was reported in the media as seeking the counsel and blessing of Willie Brown and Rose Pak – and no one else. By late October, four political corruption cases landed on Gascon’s desk involving Lee’s campaign, Willie Brown or Rose Pak. In each case, there was direct testimony from participants drawn into schemes to violate the law regarding money laundering or campaign contributions to Ed Lee’s campaign for mayor. Pak, according to officials at Recology, the city’s garbage hauling company, acknowledged Pak made multiple requests of a senior executive that staffers should participate in a shadow petition campaign to encourage Lee to run. As the press reported, this took place while Recology’s contract was facing a vote at City Hall. Former state senator and Judge Quentin Kopp wrote to Gascon asking him to convene a criminal grand jury into corrupt influence in the election. That was August 10, 2011. To date there has been no action, and no suggestion from Mayor Lee that Rose Pak should suspend her contacts with him while the investigation is underway. Gascon’s press office told CitiReport this week that it is unable at this time to confirm the status of this investigation. By press deadline, the office still was unable to provide an updated status. At the same time, Gascon was pressed to investigate “Progress for All,” the committee gathering signatures that Pak sought to enlist Recology as a participant. One of the four co-chairs was Victor Hwang, an Assistant District Attorney in Gascon’s office. One of its prime boosters was Willie Brown, the Chronicle columnist, former mayor, and City Hall fixer. Gascon sought the views of Kamala Harris, the Attorney General and former District Attorney, on whether there was a conflict. That request was made on Monday. By Thursday, Harris’ office confirmed to Gascon that there was not a conflict and he could proceed. On October 12, Gascon announced his office had begun a criminal investigation into allegations that Go Lorrie’s employees were used to launder campaign contributions into Ed Lee’s campaign. The company, an airport shuttle service, won a change in the Airport’s staging for shuttle services a week after the fundraiser where laundered contributions were alleged to have been made. In that case, two employees came forward to admit that they had been promised that their contributions to Lee’s campaign would be reimbursed by the company or its officials. Lee’s own campaign claimed that it suspected wrongdoing at the time and returned 23 contributions totaling $11,500. Gascon, however, wasn’t one to launch himself into action with the election for both Lee and himself a month away. “It is premature to form opinions or rush to judgment until an investigation is complete,” Gascon said in a statement his office put out. However, the election is over and the contract was awarded to Go Lorrie. Then on October 24, Gascon found himself in the position of announcing yet another investigation into illegal campaign activity aimed at electing Ed Lee as mayor. The San Francisco Neighbor Alliance allegedly operated a quasi-voting booth in Chinatown with staff members “helping” voters to case ballots for Lee. The evidence included the email stating that the contributions would be reimbursed, which would be money laundering, and direct testimony from some involved in the scheme. “If this is true, then these people have perjured themselves,” Lee campaign spokesman Tony Winnicker said when The Chronicle informed him about the donations. “They looked directly into the eyes of our campaign staff and lied, and they should be held accountable,” the Chronicle wrote on November 1, before the election. Gascon said he was “evaluating” the information; and a week after the Election, indicated that the investigation remains open. That leaves four open investigations into illegal campaign activity aimed at electing Ed Lee months after Gascon accepted the case. Those cases are: Rose Pak’s solicitation of illegal campaign activity from Recology; illegal election activity by San Francisco Neighbor Alliance, and money laundering cases involving Go Lorrie, an airport contractor, and property managers at Archway Property Services. The tally for the rest of Gascon’s first year as DA and during his campaign to be elected includes delaying action for months as the clock ticked toward Election Day with regard potentially sensitive cases involving a bicyclist hitting and killing a pedestrian, police officers violating the law, and a Muni bus driver who killed a pedestrian, and cancelling a full investigation into illegal campaign activity by a Rose Pak-Willie Brown connected committee supporting an Ed Lee candidacy. Will This Be a Reform Board?